Many Spaniards tried to establish settlers on the Baja peninsula, including the great Cortez himself. He went broke trying to establish a town at La Paz. 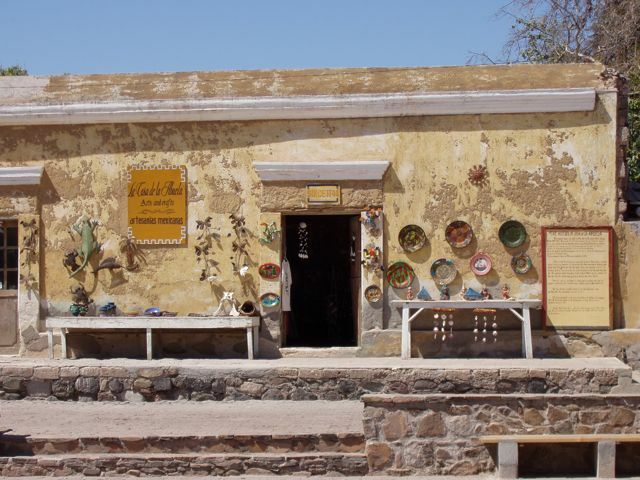 The first successful Spanish settlement was here at Loreto, by the Jesuits in 1697. On October 19, 1697, Jesuit Father Juan María de Salvatierra began the famous (or infamous) Mission system, extending into California Alto, or Upper California. 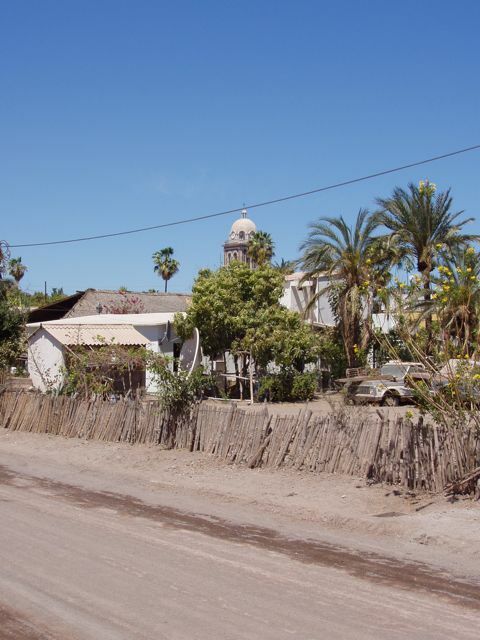 In 1683, Father Kino (we think), evidently, built the first and very small mission, but the first large mission was in Loreto. That building is shown in the photos below. Loreto was "discovered" by the world in the 1970s and has since become a center for "eco-tourism", kayaking, diving, and other sports. 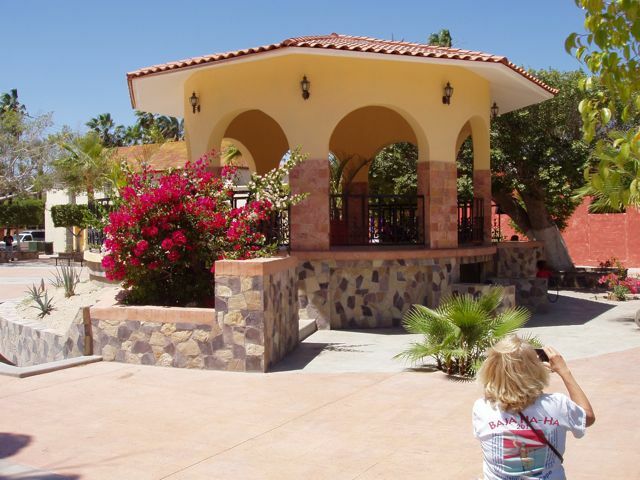 As the former capital of all of California (Alta and Baja), it has a strong history of administration. It served as the capital of Las Californias from 1697 to 1777. 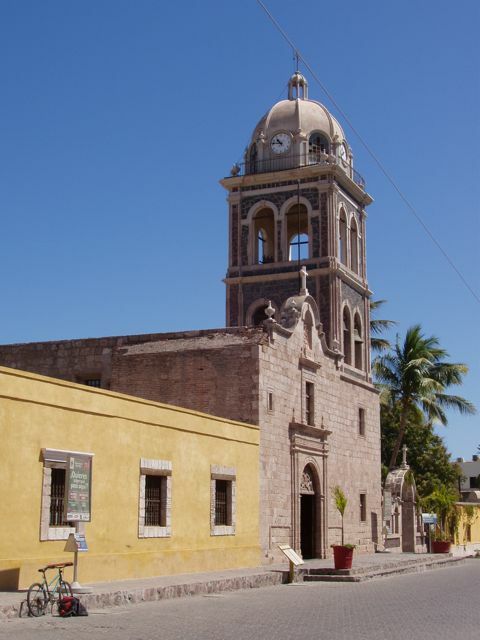 Loreto is a well-run town of 15,000 with 2,000 Gringo citizens for all or part of the year. 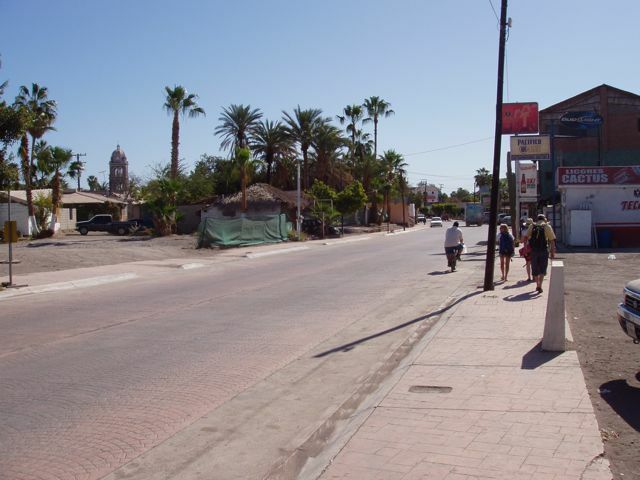 Public projects are completed in Loreto and the town is kept spotlessly clean by an army of street cleaners. Jesus the cool guy: wind-blown hair, smiling, trimmed beard. This is not the agonized and bloody Jesus found nailed to a cross, for sure. 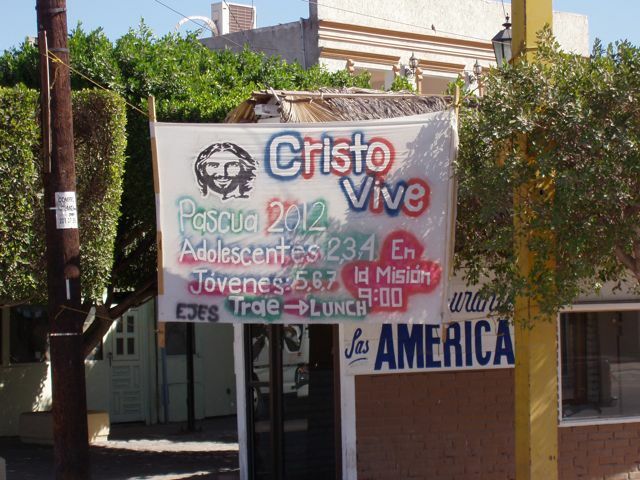 "Christ lives" the sign proclaims, with times for each age group. Our group of tourists stroll down a Loreto street. The Mission is on the left background. The Mission itself is an historically important structure, dating from the early Spanish settlement days. This is photos is of a large statute in the main church. 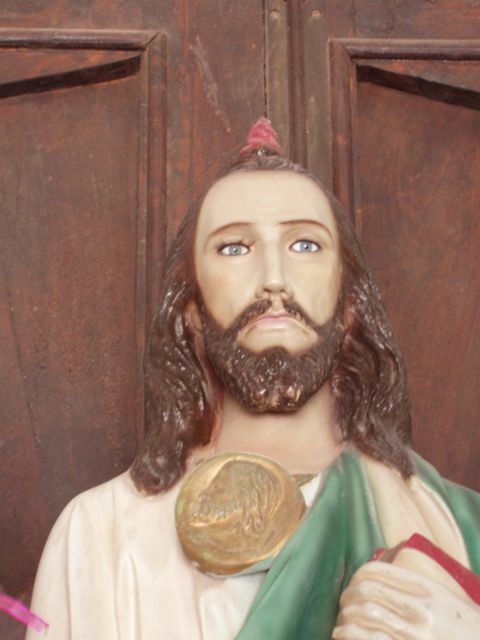 To prevent any association with the locals, the Jesus has blue eyes, just like any other Mideastern man (hmmmmmm). Oddly, he also has a growth coming from his head. An antenna? The gold-plated alter in the Mission. Brought from Italy in the 1730s, the gold-plated wood and beautiful murals of saints has been impressing visitors for hundreds of years. The photo was taken with ambient light, so the brightly illuminated statue of La Virgin and Baby Jesus are too light. Built on the site of the original mission house, this is a reconstruction of the original that housed the church folk who ruled their flock here. Half of the building houses this artists' center, the other half houses the family that rebuilt the house in the late 1800s. 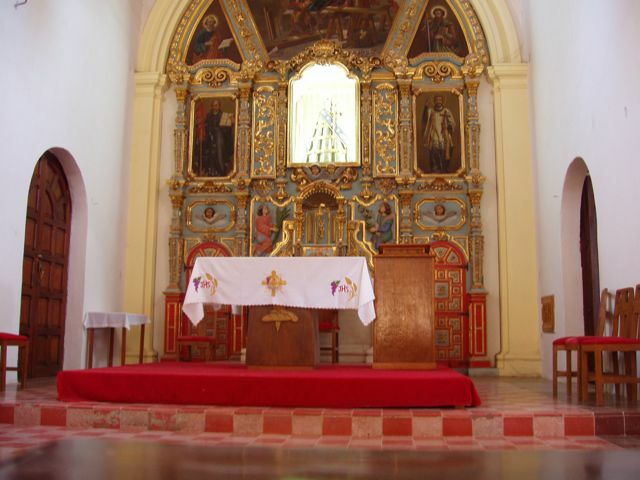 El Mission de Nuestra Señora de Loreto. Usually proclaimed as the first of the thirteen missions built by the various sects (Dominican, Jesuit, or Franciscan) to dominate and control.....er... save, the local indians, it is actually the second. According to the literature, the original structure was badly designed and has almost no square corners. The beginning of the famous El Camino Real, or Royal Road that ends in Los Angeles, California. They've done a lovely job of planting and training these trees to shade the street. El Camino Real (Spanish for "The Royal Road", also known as The King's Highway) is the historic California Mission Trail, connecting the former Alta California's 21 missions (along with a number of support sites), 4 presidios, and several pueblos, originally stretching from Mission Nuestra Señora de Loreto in the south to Mission San Francisco Solano in Sonoma in the north. The route originated in Baja California Sur, Mexico, at the site of Misión San Bruno in San Bruno (the first mission established in Las Californias), though it was only maintained as far south as Loreto. San Bruno was later abandoned because it had no reliable water supply. In Baja, water first, then people. The Loreto civic plaza pays homage to the area's European history. 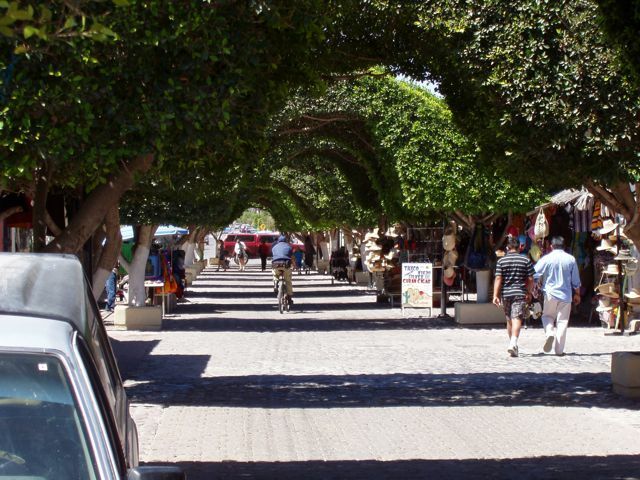 Unlike so many other Mexican towns, Loreto has completed the plaza, everything is painted, and there is landscaping everywhere. Needless to say, the area is spotless. 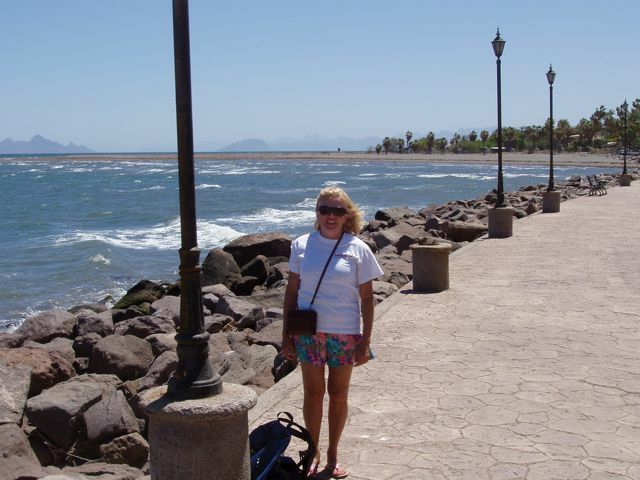 The Loreto Malecon, wind-blown by the Northerly winds, is a fitting backdrop for lovely Conni the sailor. 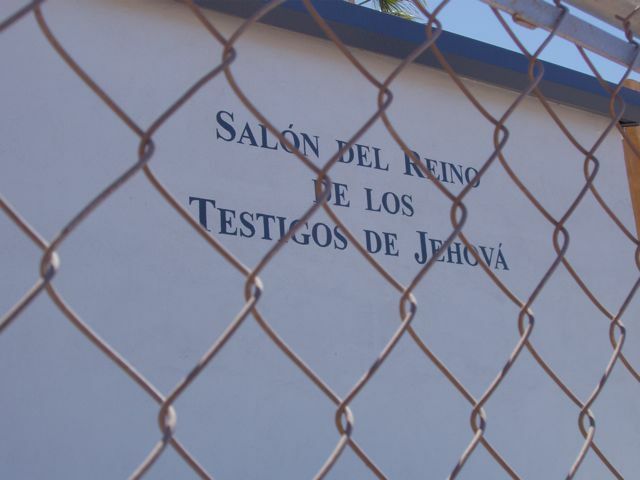 Grimly seen through chain link fencing, the Jehovah's Witnesses have arrived in Loreto. The old and new coexist here. Satellite dishes, a scrap-wood fence, and the cathedral all share space surrounded by a dirt street.